This is a completely customized vintage cake topper ordered by one of our customers. 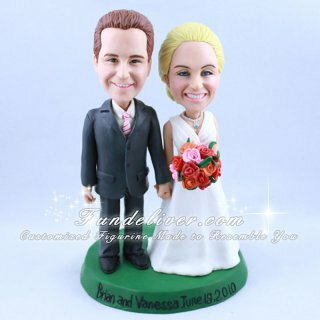 General speaking, they would like the vintage topper to look like our another guitar cake topper with no guitar, same round green base with words “Brian and Vanessa June 19, 2010” on it. Clothes - Groom: grey suit, white shirt, tie is mostly white with dark pink and orange stripes. Black shoes. Clothes - Bride: V neck dress (front and back) with detailed waistband. V neck top has large pleated gathers. No veil. Also the bride would like to make dress hem come to floor (no shoes showing). The bottom of the dress is straight, with a slight train. 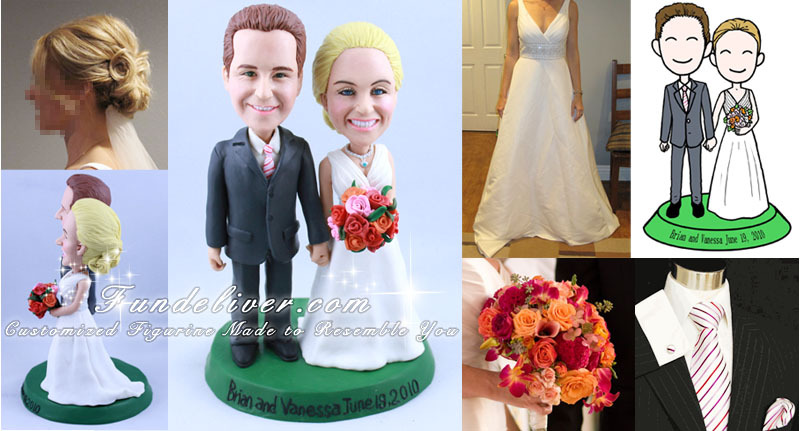 Pose - Standing close, holding hands, bride holding bouquet - just like the Guitar Player Wedding Cake Topper example. Bride's bouquet - roses: white, hot pink, orange, with green accents. Hair - Bride: Curly, loose updo in the back, bangs swept to side out of face (close to ear, not covering the face). Facial expression - both smiling. Thanks for Brian and Vanessa for the detailed instruction and images to help us make this Vintage Wedding Cake Topper so beautiful, how do you feel about it?